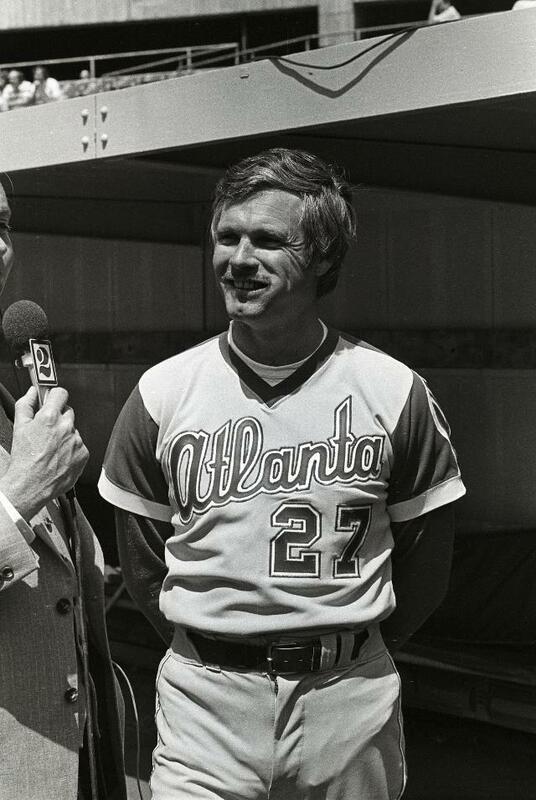 Budding media mogul Ted Turner, who had obtained the rights to broadcast Atlanta Braves games on his television station, WTCG, in 1973, purchased the franchise in 1976 and attempted to engineer an immediate reversal of its faltering fortunes. Turner dipped into the brand-new free-agent market and signed one of its trailblazers, Los Angeles Dodgers pitcher Andy Messersmith, who had won 19 games in 1975. In spite of the new owner’s hopes for an instant turnaround, Messersmith posted only an 11-11 record as the Braves finished the 1976 season in last place in the National League West with a 70-92 record, 32 games behind the first-place Cincinnati Reds. On November 17, 1976, the Braves signed another big-money free agent, San Francisco Giants outfielder Gary Matthews. Unfortunately for Turner, he had made a comment to Giants’ owner Bob Lurie about recruiting Matthews during the 1976 World Series, which constituted tampering.1 Commissioner Bowie Kuhn fined Turner $10,000, suspended him for one year,2 and forced the Braves to forfeit their first pick in the January 1977 draft. Turner protested, saying, “I am a rookie in this business. I should be allowed a few errors.”3 It may have been the only time in his life that Turner, whose arrogance and oft-outrageous statements had earned him the unflattering nickname “The Mouth of the South,” admitted that he did not know everything. Turner no doubt thought he was sane. After all the Philadelphia Athletics’ Connie Mack had set the precedent for owning and managing a ballclub. The difference between the two men, of course, was that Mack had been an ex-player whose knowledge of the game’s intricacies had garnered him the sobriquet of “The Tall Tactician” while Turner knew nothing about baseball strategy. Additionally, Turner was unaware that after Mack retired in 1950, baseball passed a new rule that prohibited an owner from managing a team in which he owned stock. The Pirates opened the scoring in the bottom of the first. Number-two hitter Frank Taveras struck out but reached first base safely when Niekro’s knuckleball got past catcher Vic Correll for a wild pitch. Dave Parker singled and advanced to second base when Braves center fielder Barry Bonnell tried unsuccessfully to throw Taveras out at third. After Al Oliver flied out, Willie Stargell was walked intentionally to load the bases, and Rennie Stennett beat out an infield single to give the Bucs a 1-0 lead. Niekro limited the damage to that lone run, and the Braves tied the game against Pirates lefty John Candelaria in the top of the second when Bonnell singled and drove in the inning’s leadoff batter, Cito Gaston, who had reached first on an error by shortstop Taveras and advanced to second on a single by Tom Paciorek. The deadlock lasted only until the bottom of the third inning, when Parker launched a solo home run to give the Pirates a 2-1 advantage that held up as the final score and extended the Braves’ losing streak to 17 games. The only excitement after Parker’s homer occurred in the top of the ninth inning. Correll hit a one-out single and gave way to pinch-runner Pat Rockett. After Bonnell flied out, Turner decided on his own to send switch-hitter Chaney to the plate to pinch-hit for Niekro. Chaney had never been asked to pinch-hit right-handed in his nine-year career and asked his teammate Rod Gilbreath, “Can you believe this?”9 Nevertheless, Chaney clouted a double, but it was a ground-rule two-bagger that forced Rockett to stop at third base. Goose Gossage relieved Candelaria and struck out pinch-hitter Rowland Office to end the game. Benson took over as manager the next day and the Braves finally won again, defeating the Pirates 6-1 behind a strong outing by starting pitcher Max Leon, who helped his own cause with three RBIs. Bristol rejoined the Braves on the following day as they returned to Atlanta to face St. Louis; he managed the team for the remainder of the season, which they finished in last place in the NL West with a 61-101 record. In addition to the sources cited in the Notes, the author used the Baseball-Reference.com and Retrosheet.org websites for material pertinent to this article. 1 Murray Chass, “Kuhn Suspends Turner, Braves’ Owner, for Year in Matthews Case, New York Times, January 3, 1977. 2 Patrick Mondout, “Mouth of the South Manages Braves (5/11/1977),” baseballchronology.com/baseball/Years/1977/May/11-Ted-Turner-Manages.asp, accessed July 16, 2016. However, Kuhn never enforced the suspension, which enabled Turner to undertake his plan for May 11, 1977. 4 Dan Epstein, Big Hair and Plastic Grass: A Funky Ride through Baseball and America in the Swinging ’70s (New York: St. Martin’s Press, 2010), 219. 5 Phil Pepe, Talkin’ Baseball: An Oral History of Baseball in the 1970s (New York: Ballantine Books, 1998), 271. 6 Doug Williams, “The Night Ted Turner Managed the Braves,” espn.go.com/blog/playbook/fandom/post/_/id/22066/the-night-ted-turner-managed-the-braves, accessed July 16, 2016. 8 Chris Landers, “38 years ago, then-Braves owner Ted Turner decided to manage his own team for a game,” m.mlb.com/cutfour/2015/05/11/123387944/38-years-ago-then-braves-owner-ted-turner-decided-to-manage-his-own-team-for-a-game, accessed July 16, 2016. 12 “Ted Turner managed to shake up baseball in ’77,” washingtontimes.com/news/2005/may/9/20050509-124705-7809r/, accessed July 16, 2016. 15 Turner Broadcasting and Time Warner merged in 1995, and Turner was vice chairman of the company until he resigned in 2003. In 2007 Time Warner sold the Braves to the Liberty Media Corporation, ending Turner’s connection to the franchise. Though Turner now is eligible to manage the team, the new Braves ownership is unlikely to indulge him.